Become a Member Today! | Patchogue Arts Council, Inc. 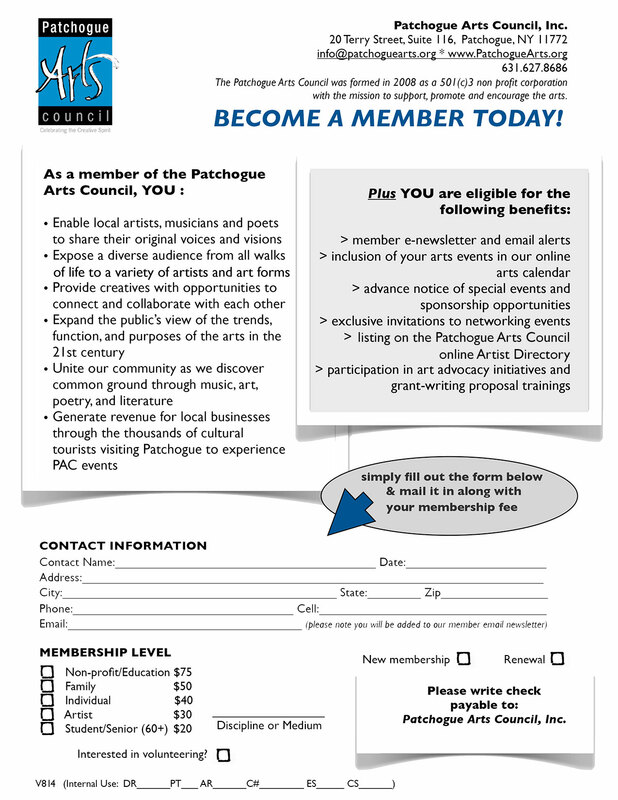 There are TWO ways to join the Patchogue Arts Council. The first way to become a member – Fill out the form below, click SUBMIT, then choose your Membership Level, and click the Purchase Button to Pay your Membership Fee with a Credit Card or PayPal. The second way to become a member –Scroll to the bottom of the page, click MEMBERSHIP FORM PDF, download the form, print, fill out and mail with a check to the address below. Make check payable to the Patchogue Arts Council, Inc. The first way to become a member. Generate revenue for local businesses through the thousands of cultural tourists visiting Patchogue to experience PAC events. The Patchogue Arts Council was formed in 2008 as a 501(c)3 non profit corporation with the mission to support, promote and encourage the arts. Study after study shows that for every dollar spent on the arts, it brings four dollars back into a community. When businesses support an organization like the Patchogue Arts Council, they can be confident that they are making a worthwhile investment. Not only will you be bringing revenue into Patchogue, your business will be recognized as champion of the arts and committed community advocate. The second way to become a member. Sorry this section being updated, coming soon! Click on word MEMBERSHIP FORM PDF to download the form, print, fill out and mail with a check to the address below. Make check payable to the Patchogue Arts Council, Inc.